Join us for a Berry Sweet Day!!! We offer nearly 8 acres of prime U-PICK strawberries for your enjoyment! Picking your own strawberries at Luckett Farms at Rosedown Plantation is a great way to make sweet memories with your family and friends. Please sign up for our email updates and watch our Facebook, Instagram, twitter, or website for more information. Luckett Farms offers CSA (community supported agriculture), U-Pick crops such as strawberries and pumpkins, corn maze, and roadside vegetable stand. During the regular strawberry season, we are open Sat and Sunday from 10 a.m. – 5:00 p.m. We are open for group and field trips only by reservation only weekdays 10 am-2pm. Please contact us to make a weekday reservation kluckettfarms@gmail.com or text or call 225-939-2998. We recommend you check our website, Facebook Page, Instagram, Twitter, or call for the most recent picking, crop, and weather conditions that may affect your u-pick experience. Luckett Farms reserves the right to close the Strawberry Field due to inclement weather (heavy rain, thunder, lightning and/or high winds) without advance notice in order to protect their customers and employees. Pre picked berries may be available for purchase as well. To ensure prepicked berries please email kluckettfarms@gmail.com or text or call 225-939-2998 to place an order. We also offer farm games/ activities, hayride, picnic area and more. We are excited that you are visiting our farm with your children! We do, however, want to inform you that it is important that you bring your stroller or wagon if your child/children need a ride out to the strawberry fields. It is a bit of a walk. Thank you for your cooperation! Due to farm safety we are not allowed to have pets in the fields. After selecting your strawberries, we recommend you take them home and put them in the fridge. Since we do not use pesticides, we recommend you only wash them before eating them. If you use a dab of vinegar with cool water in the wash they will usually keep longer. Pat them dry with paper towel after washing. You can find storage instructions and recipes on our Luckett Farms Pinterest site. Strawberries make a terrific snack, dessert, or compliment to any meal. Whether you prefer strawberry shortcake, strawberry smoothies, or strawberry pancakes, the delicious taste of strawberries is sure to delight. When purchasing berries, remember, you will want to have enough to freeze for future use. If you plan on saving strawberries for the rest of the year, freeze them when they are in season. Doing this will provide you with the best flavor and ensure you have berries to enjoy all year long. To freeze your strawberries you will want to remove the tops and core from the berry. A simple trick to remove the tops is by using a straw. A sturdy straw is a great tool. (Note: The bendable kind does not work well.) Poke the straw through the bottom of the berry aiming it toward the center of the top. Press through until the core and the top easily pops free from the rest of the strawberry. This works like a charm! After you have washed your strawberries and removed the tops, place them on a cookie sheet lined with waxed paper. A single layer spread across the cookie sheet works best. Place the cookie sheet in the freezer until the strawberries are completely frozen (about 1 hour). By doing this you prevent the berries from sticking together. Once your berries are frozen, gently transfer the strawberries into a freezer tight bag. Note: Frozen strawberries will be slightly softer after thawing when compared to fresh fruit. Stocking up on fresh, ripe strawberries when they are in season can help keep your diet healthy all year long. A few simple steps now will have you and your family enjoying the delicious sweet taste of red strawberries for months to come. Nothing compares to the taste of a fresh vine-ripened strawberry! • Unlike some other fruits, strawberries do not continue to ripen after being picked. • The strawberry plant is a perennial plant that will remain productive for about five years. • Strawberries wear their seeds on the outside, with the average berry containing approximately 200 seeds. • Strawberries are the first fruit to ripen in the spring. • Strawberries are members of the rose family. • When ripe, strawberries are bright red, juicy and very sweet. • Strawberries can also be pickled. • Seventy percent of a strawberry’s roots are located in the top three inches of soil. • The flavor of a strawberry is influenced by weather, the variety and stage of ripeness when harvested. • Strawberries are grown in every state in the United States and every province of Canada. • Strawberries are delicate and require gentle handling to prevent bruising. 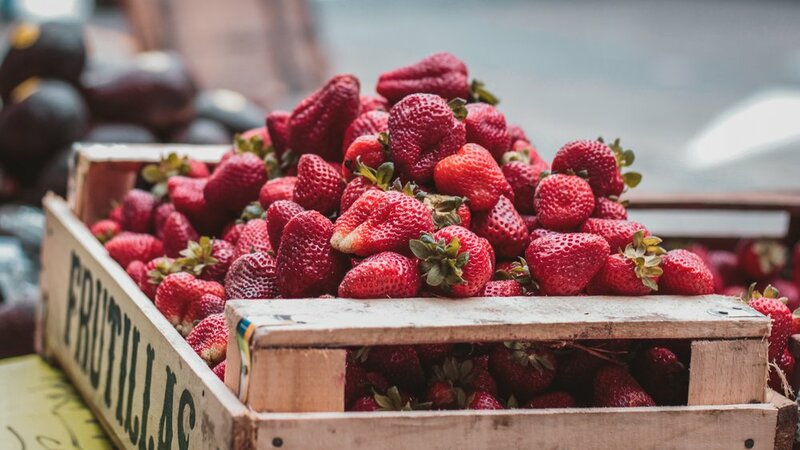 • According to the United States Department of Agriculture, the annual per capita consumption of fresh and frozen strawberries is 4.85 pounds.